South Korea has long been a favorite tourist-destination because of its rich culture, history and natural panorama. Earlier, most tourists traveling to South Korea came from the neighboring nations or, at the most, from the South East Asian nations, but the 1988 Seoul Olympics and the 2002 Soccer World Cup (which was jointly hosted by Korea and Japan) changed the scenario for the better; now Westerners touch down the South Korean soil to get a feel of this a-little-off-the-track tourist heaven. The improvement of transportation infrastructure (even in the remote regions) has further bettered South Korea tourism. Come to South Korea to experience the unusual journey on your own; you will love every aspect of it – its unique natural beauty, its temples and pagodas, its unperturbed fishing villages and fast-paced cities, its colorful festivals and its culinary delights – everything. Seoul: The capital city of Seoul is the place to begin your tour. Seoul is a city that takes pride in its cultural legacy but has not had any qualms about going hi-tech or embracing modernity. Sightseeing in Seoul means visiting its age-old temples and its splendid palaces like Changdeok Palace, Gyeongbok Palace, Jongmyo Shrine, etc. Trips to the city’s beautiful parks and gardens like Biwon Garden and Hangang Park will please you. Other attractions of the city include the National Theater, the Olympic Park and the War Museum. Seoul has many theme-based amusement parks, supermarkets and a packed nightlife. If you are interested in ‘folk’, the Korean Folk Village is a mere 30-minutes drive away. 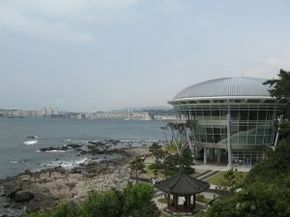 Busan: Busan, the second-largest city of South Korea, is yet another great place to be in. With mountains, rivers, beaches and islands presenting a varied landscape, you will surely enjoy the scenic beauty of Busan. Additionally, you have the lures of hiking, swimming, fishing and other adventure sports. Again, if Busan’s medieval Buddhist temple, Beomeosa and Geumjeong Fortress etch a permanent impression in your minds, Busan’s PIFF Square (the venue of the Busan International Film Festival) will introduce you to a new facet of the city. Busan is famous for its hot springs and spas (the city has quite a few of them). You will also like visiting the city’s many museums. Round off your trip by tasting sea-food at the Jagalchi Market. Daegu: Daegu, South Korea’s fourth-largest city is a natural paradise with a number of hills, rivers and green parklands. The city’s lush greenery is a welcome relief from all the stress of modern life but Daegu also offers enough adventure activities for thrill-seekers. The Daegu Amusement Park will interest one and all. The city’s unique nightlife experience will leave you yearning for more. South Korea has a high-income economy and the South Korean populace enjoys high living standards. An export-oriented economy lacking in natural resources and lagging behind in agriculture (because of insurmountable hurdles), South Korea achieved its initial progress riding on the success of labor-based industries like ship-building, automobile and steel manufacturing, etc. Although South Korea still continues to be the world’s leading ship-builder nation, its present success is owed to the growing dependence of knowledge-based industries. While South Korea’s IT industry ranks among the top players in the world, the nation is ably represented by names like LG and Samsung in the electronics sector. South Korea has technically-advanced communication and transportation infrastructures. The country also has achieved enough success in nuclear power generation, which contributes a significant share of the nation’s need for electricity. South Korean culture has evolved from the Korean culture of the yester-years, but it also reveals influences of Western cultures. The South Koreans are gentle-folks who speak the Korean language and mostly follow Buddhism. The South Koreans are bound by social norms typical of the region. The same can be said about their culinary preferences because the South Koreans mostly eat rice and noodles along with fish and meat; tofu and vegetables are widely used. But when it comes to literature, music, etc. the Western/American influence is much too apparent. Board games and online games are part of South Korean culture.